What Kind of Cue Ya Want??? 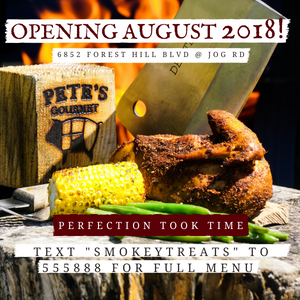 Pete’s Gourmet BBQ – Now Open!!! Forest Hill and Jog Rd. in West Palm Beach. Award Winning Barbeque! 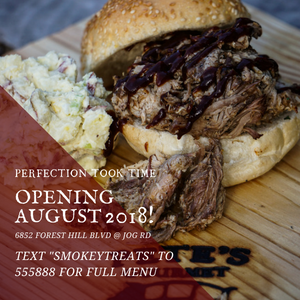 Whether you spell it barbecue, barbeque, Bar-B-Q or BBQ…if you are looking for the best BBQ in West Palm Beach, the best BBQ in Lake Worth, the best BBQ in Greenacres, the best BBQ in Wellington, or the best BBQ in Palm Beach County, you have found it!!! We are a fast casual barbeque restaurant specializing in take-out but, we also have tables just in case ya wanna chow down at here with us. We hand make barbecue chicken, pulled pork, barbecue ribs, and we even have a vegetarian option(BBQ Jackfruit). 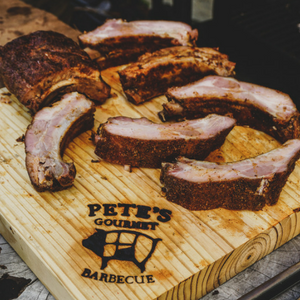 At Pete’s Gourmet BBQ, we are super passionate about our food and put our heart and soul into every item that we prepare. 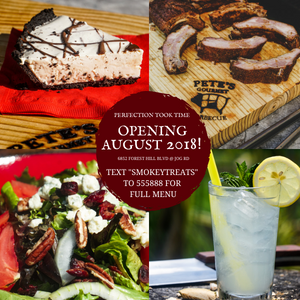 It is our passion that that drives our excellence and helps us produce the BEST BBQ chicken, the BEST pulled pork, and the BEST barbeque ribs in Palm Beach County. But don’t take our word for it, come in and try it for yourself…hope to see y’all soon!!! Text ‘smokeytreats’ to 555888 for Weekly Specials.